Claudia Rogowski, Gaston Torelli and Sven Elze would like to invite you to celebrate New Year in Berlin with a looooooong and excessive Tango-Party. We call it the NYB-Marathon. Marion Dulieux, Giuseppe Caputo, Mila Vigdorova, Michael Rühl, Viktoria Fedirko, Gaston Torelli, Felix Naschke, Claudia Rogowski, Daniela Schulz, Ala Malisa, Pedram Shahyar,& Maria Mondino. We are very happy to announce that Noelia Hurtado and Gaston Torelli will be with us during this marathon. They will perform and teach workshops + a special followers technique seminario. The great, crazy and Grammy-Award-nominated pianist Fabrizio Mocata from Italy will play on Bebop's grand piano. The main marathon will take place from 1.1.2016 - 3.1.2016 in the beautiful venue of Bebop in Kreuzberg with 300+sqm of finest parqeutte floor. Still a big surprise. We will update you on our very special opening Party. It's gonna be EPIC!!! 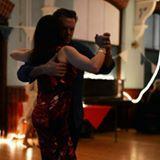 Our fee is 60€ per person for dancing, food (2x breakfast, 1x cake) and a selection of non-alcoholic drinks included. Registration for the marathon is open now. On 29th December we would like you to join us celebrating what has become the sexiest & biggest Tango Party in Europe: Intimacy @ KitKatClub. Does anyone know where to register for this? ?